Following Essay 188, 'putting the G in running’[retitled 'the end of an era? '], I return to the topic here, not just for an update but to address the concept of addiction. I had a mail from Mark. Now, this is a remarkable moment since Mark is not previously known to me, which makes his mail all the more remarkable (oops, pun). I have previously assumed that only past pupils and colleagues (old and new) would bother to hunt for scoins.net. 6 You feel negative emotions such as anxiety and depression when you do not complete a day's workout. Let us be clear: you are not required to tick all six boxes to be an addict. Nor would it necessarily be true that if you tick any four (say) that you are or are not addicted, but it would seem likely, and the recognition of an addiction is a large part of the problem. So if you’re saying to yourself “That’s not me”, you might well be in denial of a truth. Oh dear. Anorexia athletica – the compulsion to exercise, complete with anxiety over a missed session, irrespective of injury. generally coupled with insufficient food intake. Muscle dysmorphia (bigorexia) – the conviction that the body isn’t big enough and (even) more exercise will help. See the linked site for a longer explanation of these terms and the associated thinking and attitudes. I copied a little more below (below the last footnote). This should convince most of my regular readers that, however extreme you think your attitude to exercise is, there are others who have gone a whole realm further. 1. I exercise to avoid feeling irritable. 2. I exercise despite recurring physical problems. 3. I continually increase my exercise intensity to achieve the desired effects/benefits. 4. I am unable to reduce how long I exercise. 5. I would rather exercise than spend time with family/friends. 6. I spend a lot of time exercising. 7. I exercise longer than I intend. 8. I exercise to avoid feeling anxious. 9. I exercise when injured. 10. I continually increase my exercise frequency to achieve the desired effects/benefits. 11. I am unable to reduce how often I exercise. 12. I think about exercise when I should be concentrating on school/work. 13. I spend most of my free time exercising. 14. I exercise longer than I expect. 15. I exercise to avoid feeling tense. 16. I exercise despite persistent physical problems. 17. I continually increase my exercise duration to achieve the desired effects/benefits. 18. I am unable to reduce how intense I exercise. 19. I choose to exercise so that I can get out of spending time with family/friends. 20. A great deal of my time is spent exercising. 21. I exercise longer than I plan. I score low on this test, unlike the earlier one; I gave responses of mostly 1 and 2. How to measure Q6, when we’re recommended to do at least 30 mins per day? I decided that two hours was the value for ‘a lot’ and carefully forgot about teaching sport at Shiplake, where two hours a day was part of the job. Note that many questions seem to be asked twice, with mild differences that may tease out some essential of dependency. So for me, while the first set of questions left me feeling I must be an addict, the second set convince me I am far from being one. There are some simple test questions, easy to answer if you are self-honest: Have you lost perspective? Has exercise left your life in imbalance? Are you using exercise as an excuse to not do other stuff? Are you demonstrating anxiety when you miss a session (or a run, or whatever is your thing)? Is more exercise somehow better exercise (in your head)? See the wikipedia entry for a balanced view of the topic. Just when you’d found something to enjoy that isn’t illegal, immoral or fattening. ² Too. Too much. Unfair. For those whose daily fix of endorphin has become almost sufficient reason in itself, for those who feel addiction is really not so very far away, I suggest that the trick is to have as much exercise as you can genuinely enjoy while simultaneously avoiding injury. This is having as much cake (the high) as possible without the severe downer of not having the exercise because you’re injured. Of course that requires you to listen to the body carefully and it is difficult to balance what I would call competitive spirit and ambition for improvement against that lack of injury. Too often one discovers what is too much only by becoming injured. 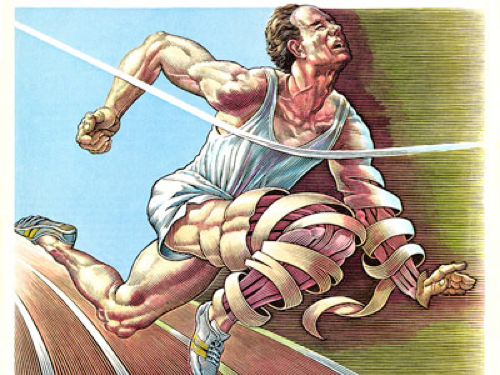 Which in turn means that the competitor is (too) often pushing the envelope to the point of small injury, which will then sum to something disabling (eventually). 1 Qs 8 and 10 are reverse marked and yes, I scored 2 there. I would offer that the qualifying ‘sometimes’ allowed me to score threes (usually, rather than the always of 4) on purpose. "The Knock at the Stage Door" in Reader's Digest (December 1933); also in A Dictionary of Catch Phrases : British and American, from the Sixteenth Century to the Present Day (1986) by Eric Partridge and Paul Beale, ISBN 041505916X, ISBN 9780415059169 . See wikiquote entry. 3 Google search “can sport seriously damage your health” also produced pointers to other things that can damage your health: eating vegetables, screen-gazing, watching sport, lawyers. That was just the first page !! Exercise bulimia is an addiction that focuses on the ritual of exercising. These people use exercise as a way to purge their body of calories they intake through eating. However, unlike bulimia, these people suffering from exercise bulimia feel they are getting a 'free pass' because they are not vomiting or using laxatives. Furthermore, friends and family members of people suffering from exercise bulimia will encourage their exercise routine and even give them titles such as 'superman' or 'superwomen.' This is despite the fact these people are inflicting incredible harm to their body as a result of their exercise addiction. Many of these people who suffer from exercise bulimia will suffer from far more health problems than those considered clinically obese. Damage to the body occurs because people suffering from exercise bulimia do not give their body enough rest needed for athletic recovery. People suffering from anorexia athletica feel compelled to engage in exercise. These people are driven to perform. If exercise is missed, the sufferer will typically feel a powerful sense of anxiety as a result. These people are known to exercise even when suffering from an injury. Many of these people increase these symptoms by failing to eat enough food to fuel their intensive exercise. The damage people may inflict on their body by engaging in intensive exercise whilst not eating enough food is enormous. This includes: decreased bone density (osteoporosis), fractures, damaged blood vessels and irregular menstrual cycles. Muscle dysmorphia is a mental disorder where the suffered believes his or her appearance is flawed. The disorder is also known as bigorexia. Many sufferers of muscle dysmorphia have above size muscles due to a preoccupation with spending an excess amount of time in the gym. However, despite having above-sized muscles, many of these people believe they are not sufficiently muscular and need to continue their exercising in order to increase muscle size. Many of these people train for around 2-4 hours a day and do not allow enough time for their muscles to fully repair before returning to the gym. Over time, this invariably causes muscle damage and long-term injury. Many of these people also abuse anabolic steroids. Muscle dysmorphia may give rise to a number of mental health problems such as depression, anxiety, low self-esteem and suicidal ideation.